This is the story of a couple who meets in what used to be an unusual way… online. Nowadays it seems that everyone other person you meet met their significant other via the internet. In the story, Natalie is living in a marriage that has had not intimacy for over ten years due to her husbands illness. When he passes away, she is lonely and wants to find a companion, so she turns to the internet where she meets Randy. He is her dream come true and when they finally meet, their love story begins in a very passionate manner. She is white and he is African-American and even though they are madly in love, the people and the world around them is not so accepting. They are faced with many adversities. Turns out also that Randy has a temper and just as surely as passion can be in the form of love, it can also be in the form of anger and violence. There were a couple things I really liked about the book. One was that it was written in kind of a diary form. It felt like I was sneaking a peek into someone’s real life. Secondly, I loved the fact that Ms. Randall included a related poem that she had written at the beginning of every chapter. The chapters are very short and very readable, which keeps the story flowing nicely. 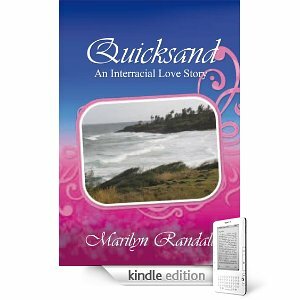 Quicksand is a nice easy summer read and a good story.